The 18 ways to use Dr. Bronner’s 18 in 1 Castile Soap! There’s nothing I love more than multipurpose products! 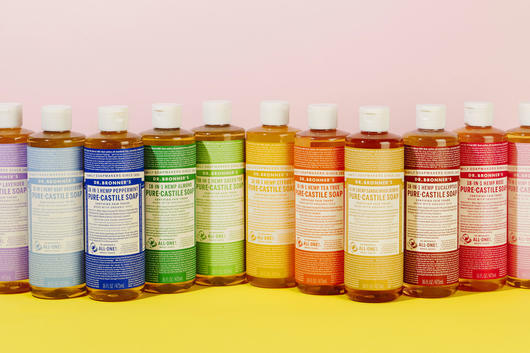 These 18 in 1 Dr. Bronner's Castile Soaps can be used for anything from face and body wash to toilet cleaner and dog shampoo! 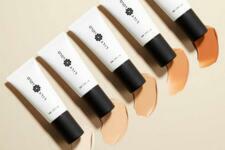 There’s nothing I love more than multipurpose products! 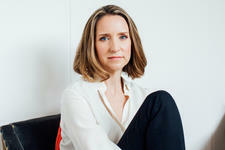 It’s always good to know that you’re getting the most out of your money when making a purchase. That’s why I often recommend the Dr. Bronner’s Castile Soaps. These classic soaps are renowned for their quality, versatility and eco-friendliness. They’re made with simple ingredients including organic Olive and Hemp. These fantastic liquid soaps are actually three times more concentrated than mainstream liquid soaps! They’re also environmentally friendly and last such a long time. 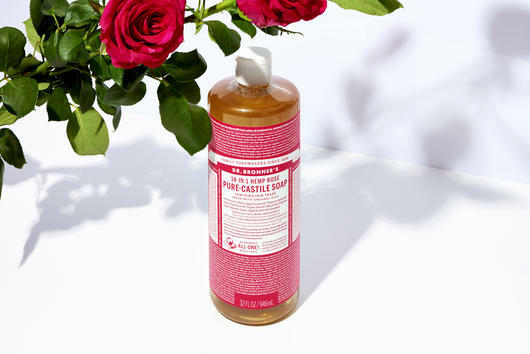 Although typically used as a hand or body wash, did you know that these castile soaps can also be used to clean your toilet, dog and even vegetables?! There’s not much that these soaps can’t do! How you can use Dr Bronner’s Castile Soaps on your body! You can actually use the Dr. Bronner’s Castile Soaps as a natural facial cleanser, no matter your skin type. This is ultra gentle and perfect for anyone who likes a simple formulation which melts away makeup and sunscreen without stripping the skin. Simply apply two to three drops onto wet hands, then apply to your wet face and massage into skin. For a classic and effective body wash which works to wipe away all of the day's dirt and grime and leave you feeling fresh and clean, all you need to do is squirt one small drop onto a wet wash cloth or sponge, then apply to your wet body and lather into a rich foam. Yes, you can even use these Castile Soaps as a natural shampoo! Mix ½ tbsp into your hand and work into wet hair, massaging into a lather. Alternatively, you can dilute ½ tbsp into ½ a cup of water for a slightly weaker solution. To get the most out of your relaxing bath, simply add 2 tbsp of the soap into your bath water for a light foam and nourishing addition. It’s relaxing, cleaning and smells amazing! Plus your skin will feel so soft. I love adding the classic Lavender scent to my bath. For men who want a clean facial shave, work 10 drops into a lather, then apply to skin. For shaving underarms I recommend 3 drops and for legs ½ tsp. Massage into skin as you go to help prevent razor irritation and achieve a close shave. If you can stand the thought of soap in your mouth, the Dr. Bronner’s Castile Soap can actually also be used as a toothpaste! Just add 1 drop to your toothbrush. I recommend the Peppermint scent for this purpose! Ideal for the Winter months or whenever your nose feels congested or stuffy, you can also add these soaps to your steam treatment to give it a nice scent and help relieve discomfort. Add 1 tbsp into a bowl of hot water, then place a towel loosely over your head and deeply breathe in the steam. For a relaxing end to a long day, you can use the Castile Soaps as a soothing and hydrating foot bath to help relax tired or swollen feet. Add 1.5 tsp of the soap into a small tub of warm water, place your feet inside, then sit back and relax for as long as you like! How can you use Dr. Bronner’s Castile Soaps around the house? To clean your dishes with a safe and natural washing liquid, you can dilute the Castile Soap 1:10 with water to create a gentle detergent which works to remove food and stains and leave your dishes sparkling clean. Another great way to use the castile soaps is as a laundry detergent that won’t leave any residue on your clothing and thoroughly removes dirt and grease. Add ⅓ - ½ cup of the soap into a large load. You can also mix in ½ cup of vinegar to keep whites looking bright. For spot cleaning, massage a small amount into the affected area to lather and lift the stain. 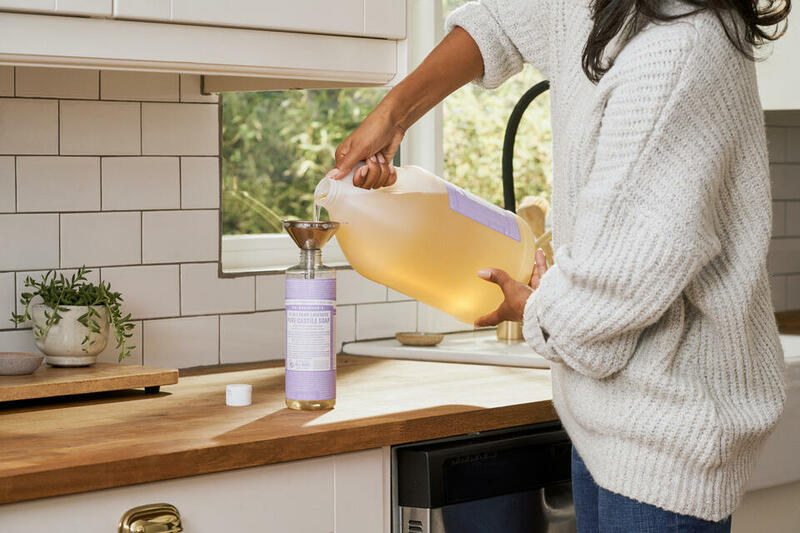 For a multipurpose spray that you can use all around the house, you can mix ¼ cup of your favourite castile soap into a spray bottle filled with water, then wipe down surfaces in the kitchen, bathroom or wherever as needed. I sometimes like to add in ¼ tsp of tea tree essential oil for extra cleaning and antibacterial power. To get streak-free, crisp and clean windows, simply mix 1 tbsp of castile soap into a spray bottle. For a more effective clean you can also add vinegar! Then just wipe down with a squeegee or microfibre cloth to remove marks, water spots and dirt. There’s nothing worse than a grubby toilet! To clean yours with your castile soap, dilute 1:4 with water in a spray bottle, then spray into your toilet bowl and sprinkle baking soda onto your scrubbing brush. Scrub your toilet and leave to sit for 10 minutes before flushing away to reveal a sparkling clean loo. What are some other unexpected ways you can use Dr. Bronner’s Castile Soap? Who would have thought that you could also use this soap to clean fruits and veggies?! Simply mix a small dash of the soap into a bowl of water, then scrub away dirt or residue from your fresh produce. After cleaning, rinse in fresh water. Even your pups can benefit from castile soap! Depending on the size of your dog, the amount you use will vary. Wet your dog thoroughly and work the soap into their fur until you reach a lather. Massage as needed, then rinse, and watch out for that shake! The Baby Unscented Mild version is ideal for pups. To discourage critters and make sure that bugs leave your plants alone, you can mix 1 tbsp of the soap into some water in a spray bottle, then spritz over leaves, buds or flowers. If you want to improve the strength of this formula, add in ½ tsp of cayenne pepper or cinnamon. If you have annoying ant problems around the house, you can also create a more concentrated version of the plant spray to deter them. Mix ¼ cup of tea tree soap into your spray bottle and spray around trouble spots to help control ants and discourage them from visiting your house.